Thousands of people in the besieged Gaza Strip have attended the funerals of the four young Palestinians killed by Israeli forces during mass protests along the perimeter fence with Israel. Tens of thousands of Palestinians on Saturday gathered at the fence to mark the first anniversary of the Great March of Return rallies, facing off against Israeli tanks and soldiers who used live rounds, rubber bullets and tear gas on the protesters. Tamer Abu el-Khair, 17, was shot in the chest east of Khan Younis in southern Gaza and later died at a hospital, according to the health ministry in the coastal enclave, which has been under a crippling Israeli-Egyptian blockade for the past 12 years. Two other 17-year-olds – Adham Amara and Belal al-Najjar – were also killed. 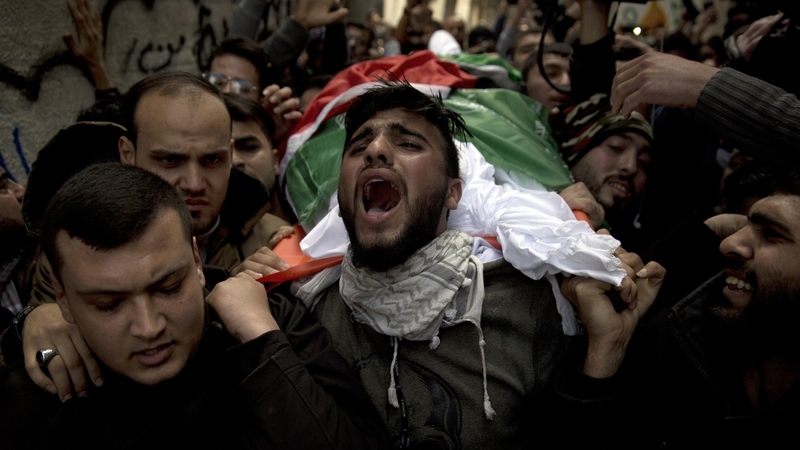 A fourth Palestinian, 20-year-old Mohamed Jihad Saad, was killed in an overnight protest before the main demonstration. Since March 30 last year, Palestinians in the Hamas-run Strip have been demanding the right to return to lands from which their families were violently expelled during the founding of Israel in 1948. Protesters in the weekly rallies are also calling for an end to the blockade. At least 207 people were wounded on Saturday, the health ministry said. On Sunday, local media in Gaza published images of Ismail Haniya, the political chief of Hamas, walking alongside el-Khair’s relatives during the funeral. Separately, Israeli authorities on Sunday reopened the Karam Abu Salem commercial crossing and the Erez crossing with Gaza, six days after shutting them down amid an exchange of heavy fire between Israel and Hamas. Israel regularly seals off the two crossings, which facilitate the movement of Palestinians with hard-to-obtain Israeli permits, as well as goods and services. The Karam Abu Salem crossing is the primary passageway that transfers necessities to Gaza’s nearly two million residents, including cooking gas, wheat and flour. It is usually closed during official Israeli holidays and on weekends, and also facilitates in the delivery of foreign aid to Gaza. Al Jazeera’s Mohammed Jamjoom, reporting from Gaza, said the opening of the crossings was a “clear indication” that Egyptian-led mediation efforts were on a positive track. One of the reasons behind the relative calm, Jamjoom said, is that despite flare-ups the situation at the protests on Saturday remained “far less chaotic than people had feared it might become”. Meanwhile, Nizar Ayash, the head of Gaza’s fishermen’s union, told local media that Israel would expand the fishing zone that it enforces in the waters off the Strip from six nautical miles to 15, starting April 1. Expansions occasionally occur and usually last for only three months at a time with the objective of boosting Gaza’s economy, which is heavily reliant on the fishing sector. Hamas-affiliated news outlets reported on Saturday that an Egyptian-brokered deal had been reached between the two sides, paving the way for the easing of these restrictions. On Saturday, Abdullatif al-Kanoo, a spokesman for Hamas, confirmed the agreement to Al Jazeera, saying Egyptian mediators “succeeded in extracting approvals” from Israel to ease restrictions on employment, fishing, electricity and aid from Qatar. Humanitarian agencies blame the blockade for the high rates of poverty and unemployment in Gaza – a main reason for the weekly protests. More than 260 Palestinians have been killed since the start of the demonstrations, mostly by Israeli fire, according to the health ministry in Gaza. Thousands of others have been wounded. Israel’s use of lethal force against protesters has drawn criticism from the United Nations, as well as rights groups.